LITTLE ROCK – Learning to make positive change outside begins with changes inside – the premise behind LeadAR, a two-year program that has given scores of Arkansans the confidence and skills to make lasting improvements to their communities. “LeadAR takes emerging leaders and develops their expertise in addressing critical problems facing Arkansas communities,” said Noah Washburn, LeadAR Program Director with the University of Arkansas System Division of Agriculture. In its 33 years, LeadAR counts state legislators, quorum court, city council and school board members among its alumni, with nearly all of them crediting the program for giving them the confidence to seek elected office. Among the hundreds of LeadAR alumni statewide are hundreds of projects that helped improve the local economy, schools or situations for those in need. “It’s more than a class,” he said. “Over the two years of this intensive program, you will be immersed in an array of topics including: leadership theory, effective communication, critical thinking, emotional intelligence, emerging technology, and complex social and cultural issues. Attend eight three-day seminars held across the state. Participate in a 7-day National Study Tour in Washington, D.C. Attend an 11-day International Study Tour outside the United States. Complete individual and group assignments, including a leadership project within your community. This equates to 42 days of formal program instruction plus some additional time commitment to complete assignments. Tuition is a fraction of the true cost of participation, as each class is generously supported by LeadAR alumni, corporate donors, foundations, and the UA System Division of Agriculture. The tuition is $3,000.00 for the two-year program. The program covers the majority of the costs during the two years. 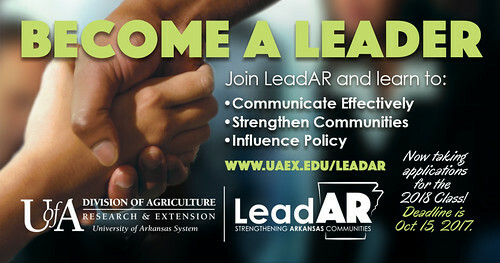 To learn more about LeadAR and to apply to the program, please visit www.uaex.edu/leadar. The University of Arkansas System Division of Agriculture is an equal opportunity/equal access/affirmative action institution. If you require a reasonable accommodation to participate or need materials in another format, please contact the LeadAR office at 501-671-2064 as soon as possible. Dial 711 for Arkansas Relay.